In celebration of opening our new St. Albans Office, and for a limited time only, send us any Vermont physical property address, within Grand Isle or Franklin County, your contact information, and the approximate parcel size and we will provide you, at no cost, with one (1) Color GIS Site Map and analysis (approx. $250 value). This will include an 11” x 17” GIS-based color aerial map of the existing property prepared by our GIS Analyst with pertinent available environmental and site related information from various sources, including soils, wetlands, streams, tax parcel data, contours, areas of steep slope and/or floodplain. The map is yours to keep and there are no obligations, however we have limited this offer to the first 100 requests so we can continue to serve our existing clients while producing free quality maps. TCE’s staff includes surveyors, civil engineers, a landscape architect, and an environmental scientist who are available to meet with you in person at our St. Albans Location, at 42 Mapleville Depot, to discuss any potential project and see how we can add value to your Franklin County or Grand Isle County property – the initial consultation is also 100% free! We sincerely hope this map and our professional advice can assist you with planning your needs for the future. We have extensive experience in residential, commercial, industrial and renewable energy projects. From single family septic systems to multi-million dollar commercial projects we’re ready to help your project become a success. Whatever your goals are, perhaps where to build a new home, or see if it is possible to subdivide your land, review soils or agricultural potential, or just identify potential areas for conservation; it always starts with a good map! If you are interested in renewable energy, TCE has partners that can discuss solar energy opportunities on your land. If you are unsure of your boundaries we can provide more information on property surveying and costs, and please note that the GIS map we provide is NOT a boundary survey. We can provide free estimates for survey work upon request. To request your free map, email freemap@tcevt.com and note the location, physical or E911 address, approx. parcel size, and any other pertinent information you want us to consider. If you know someone else who may be interested in this offer, we appreciate your forwarding this information. 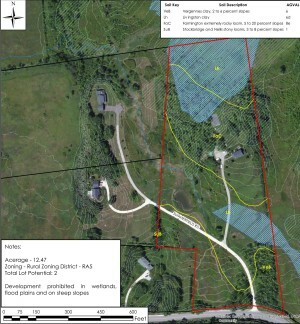 The Client acknowledges there may be severe environmental and/or site limitations as well as municipal planning and zoning considerations that may restrict or prohibit the development of the property. TCE shall exercise usual and customary professional care in its efforts to comply with codes, standards, regulations, and ordinances in effect. The Client acknowledges that such requirements may be subject to various and contradictory interpretations. TCE, therefore, will use reasonable professional efforts and judgment to interpret applicable requirements as they apply to the property. All documents prepared by TCE pursuant to this offer are instruments of professional service intended for one-time use. They are and shall remain the property of TCE. Any reuse or adaptation without written approval by TCE is prohibited.